Westport’s Representative Town Meeting made 2 important decisions last night. 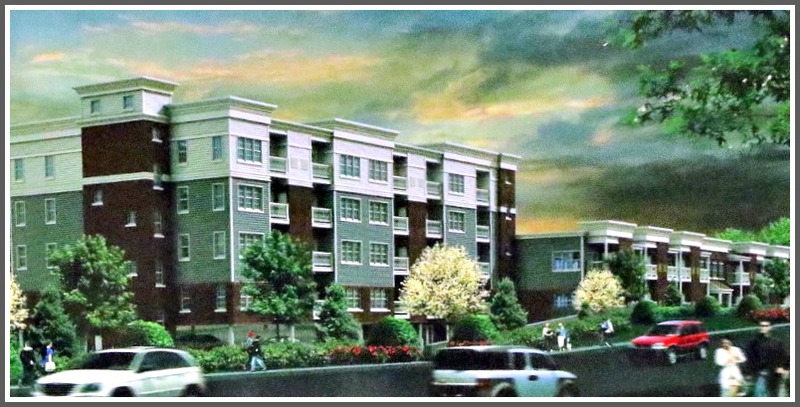 In a 23-9 vote, the RTM denied a petition to overturn the Planning and Zoning Commission’s approval of a 4-story, 94-unit rental building on Post Road East, opposite Crate & Barrel. The decision brings the property one step closer to construction — and the town closer to a 4-year moratorium on building additional “affordable housing” units under state 8-30g regulations. Thirty of the units would be “affordable,” as defined by Connecticut law. The newest design looks “more residential” than an earlier version, developer Philip Craft says. It includes 54 studio apartments, and 40 1-bedroom units. The redesigned 4-story 1177 Post Road East rental property. The RTM also authorized $70,000 for design and engineering plans, for a walkway and restrooms at Compo’s South Beach. That vote was 24-2, with 1 abstention. This entry was posted in Beach, Local politics, Real estate and tagged 1177 Post Road East, Compo Beach, Planning and Zoning Commission, Westport RTM. Bookmark the permalink. I did not see the old design but the new one looks like a factory not “more residential” Our town re dos of Hales court and the trailer park look more residential. How about something that looks like a home than an apartment building..
Last night I attended both the RTM work session and the meeting that followed. I came away with a renewed respect for both the P&Z committee of the RTM and the P&Z itself. Whether or not you agree with their decision on 1177 Post Road East, let me assure you that these are people who care deeply about Westport and have done a yeoman’s job of weighing all the factors that go into voting on an 8-30g proposal. In terms of how the structure looks, I, too, would like the design to be more in keeping with the character of the town. But the sad truth is that Westport has no real say in the aesthetics of an 8-30g property. The new design, in my opinion, is much improved from the original. That said, I hope the developer continues to refine the plan to better integrate with its surroundings. Anyone who has seen what’s going up in Stamford, Norwalk, BlackRock or any other places knows that blocks upon blocks of new construction exactly like this! Pedestrian, nothing original or even attractive. It looks cheap, cookie cutter, and will not add anything to the otherwise beautiful town of Westport. It will be outdated before construction has even started. Horrible. This is the improved version? It looks like an evil robot made out of McMansions. Welcome to Westchester. Hahaha… ‘army of robots’ Mr. Boyd. Also you forgot to mention the charcoal coloured apocalyptic looking cloud in the form of a skull at the right of the rendering. It’s all about the money and restrictive zoning that historically prevented and continues to prevent sufficient affordable housing from being built in Westport. But what has that got to do with a poor design-or in this case no real design ? “it looks like stacked shoe boxes,” is what one local architect told me when I asked his opinion as to why it just does not look appealing or fit in with Westport’s character , never mind the surrounding neighborhood. Are you suggesting that because it’s largely affordable housing they will cut corners and only put the bare minimum into the project.? Not suggesting they will cut corners – I trust Westport’s building inspectors will prevent a shoddy job, and not all of the units will be “affordable” so building crappy units is probably not in the developer’s best interest. However, money and restrictive zoning is the ultimate reason for a 4 story building which is what is presumably “out of character” for Westport. I would imagine the developers can’t make the economics work (or would make a lot less money) if they build lower density, two story, partially affordable dwellings that are more “in character” for Westport. But 8-30g lets them get around the restrictive zoning and money is what provides the incentive, which was the whole point of 8-30g. I’m also suggesting that Westport has largely brought this on itself knowing full well what the Connecticut’s affordable housing rules were but choosing to not do anything about the issue other than whine about the 8-30g rules and how unfair or ill-conceived they are. Like them or not, fair or unfair, they are what they are and have been in place for a long time – certainly long enough to either figure out how to meet the rules, work to change them (likely with little success) or challenge them in court (also likely to be unsuccessful). Sad for Westport but it’s going the the way of the world it seems. Looks like any city/town USA new apartment homes. We are now surrounded with this “design” where we live also. 3 new complexes have just been erected right around us all within a few blocks of us — they look identical to this. Pretty ugly. Some of these structures aren’t sound proofed well– I’ve heard.. Also with these complexes multiplying around us, the construction to add infrastructure to support these dwellings has been horrific this summer and fall. Took me 10 minutes to go 2 lights the other day. The traffic will more than double soon as these homes begin to be occupied and we live in an inner ring suburb. Sorry for unique Westport but not sure how any city or town can avoid this anymore. And not sure how affordable they will be. Here, they’re starting at about $1700 – 1800 for studios/1 bedrooms and up from there into the 4K’s per month for rentals. So in Westport?